Toast the star anise and fennel seeds in a hot, dry pan until fragrant. Remove to cool slightly, then grind to a fine powder using a pestle and mortar. In a blender, add the parsley & tarragon, garlic cloves, star anise and fennel seed powder and the fennel pollen. Blitz on low speed while slowly adding the olive oil. Continue to mix until smooth. Season with salt. Place the leg of lamb on a chopping board and open so that it is flat against the board. Rub the marinade on all sides of the leg. Place in a container and cover. Place in the fridge for 24 hours. Remove from the fridge and roll the leg back to form a log. Using butcher’s twine, tie the leg together. Place the rod from the spit through the middle of the leg and fasten using the adjustable forks. Set the charcoals in the tray of The HUB BBQ, following the instructions on the user’s manual and press the lighting button on the front of the BBQ. Place the skewer back on the rotisserie poles that have been previously placed on the highest setting, and press the rotisserie button also on the front of the BBQ. Baste the leg of lamb with the honey. Using a thermometer probe as well as an infrared thermometer gun, cook until the temperature reaches approximately 60°C on the outside of the meat and 56°C in the core. During this 3-4-hour cooking time, manage the heat by continuing to add coals throughout the process and moving the charcoal around. Once the temperature has been reached, remove the leg of lamb from the rotisserie and cover with aluminium foil. Allow to rest on a cooling rack over a tray for 30 minutes. During this time, the lamb will continue to cook reaching a final temperature of approximately 60°C. In the meantime, slice fennel top to bottom about 1cm thick and cut the carrots in half lengthways. Reserve the fennel to be cooked on the BBQ. For the carrots, place them in a medium pan with butter and cover with a lid. Cook over medium heat until the carrots are cooked but retain their shape. 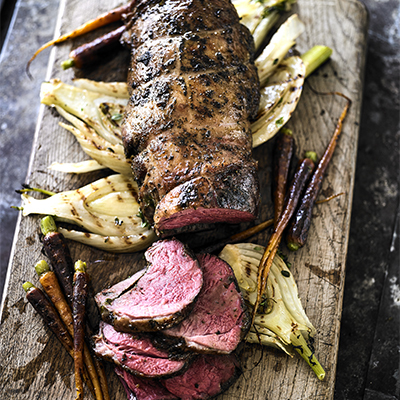 While the leg of lamb is resting, place the cooked carrots and the fennel on the grill of The HUB and cook until charred. Glaze the carrots with some of the reserved cooking butter. Place the vegetables on a serving platter and place the slices of the leg of lamb on top.